The ultimate non-contact team ball sport that anyone can play – that is a good summary of this growth sport! A 16 x 8 metre court filled with sand and divided by a net, sets the scene for teams to send the ball over the net into the other court, using any part of the body. If the ball hits the sand in court, or goes out, the rally is over. Age is no barrier, and our entry level competitions support all ranges of fitness and capability. Teams are graded on the overall capability of the team. 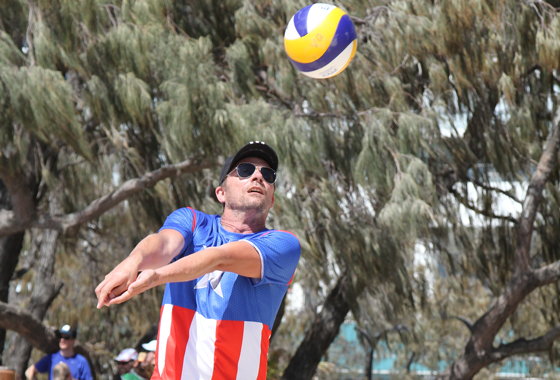 So, whether you are an experienced player or a beginner, we strive to offer you a good, fun season of beach volleyball! Free coaching and support is available to all players upon request. The number of grades in each of the competitions depends on team nominations. The first 3-5 weeks of the season are grading games that will help determine which grade your team will play in throughout the season. Teams will then be placed into an appropriate grade and play for the rest of the season. This is followed by an additional weeks for Semi Finals, Grand Finals and Trophy Presentations. A competitive, 4-a-side competition, with C Grade still supporting entry level players who are keen to develop skills, and B Grade targeting established players still developing their skills. A 3-a-side competition, focusing on. It is designed to introduce you to the game and give you the skills to join one of the more competitive competitions is you wish. Games on this evening are played in pairs & 4-a-side in separate competitions. Registration fee must be paid by week 3. Team Game Fees are due prior to playing and must be paid in full, irrespective of how many players participate in the game. Team fees vary, depending on the size of the team in the competition. Individual’s costs are lessened if you have more than the minimum number of players rotating through a game. Multiple games played may result in a discount. Please see our staff if you have any questions.